Pictured above: All four Startup Alleghenies coaches including the two newest additions Andrew Trexler (Bedford) and Debra Clark (Huntingdon and Fulton), as well as existing coaches Rick Lasek (Blair County) and our very own, Jose Luis (Cambria). 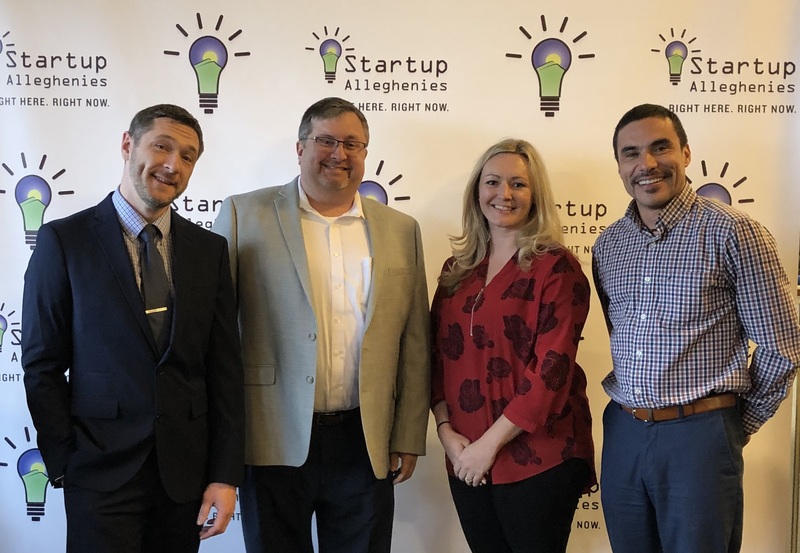 Startup Alleghenies (SUA) is ready to support entrepreneurs in the Alleghenies from three additional counties, Bedford, Fulton and Huntingdon. This expansion means that the Startup Alleghenies movement has expanded to all six counties in the Southern Alleghenies, and often, beyond. “We’re delighted to welcome entrepreneurs and partners from Bedford, Fulton and Huntingdon Counties into the Right Here. Right Now. movement we launched to create the next great startup zone in the Alleghenies,” said Debbi Prosser, director business-development, Southern Alleghenies Planning and Development Commission (SAP&DC). Andrew Trexler will focus on Bedford County while employed by the Bedford County Development Association, and Deborah Clark, will cover Huntingdon and Fulton Counties while employed by Huntingdon County Business and Industry. In addition to personalized coaching, Startup Allenghenies entrepreneurs benefit from a network of resources available ecosystem-wide, including nine entrepreneur work spaces, programs such as TechCelerators and the BIG IDEA Contests organized by Startup Alleghenies Founding partner, Ben Franklin Technology Partners, as well as help with business plan development from St. Francis University Small Business Development Center (SBDC), marketing, legal and financial advice. Startup Alleghenies partners also sponsor networking opportunities for entrepreneurs throughout the year. Prosser credits additional funding from the Appalachian Regional Commission (ARC) with making this growth possible. “In expanding our POWER grant, by just over $1.2 million, ARC acknowledged Startup Alleghenies success, due in large part to our network of committed partners in Blair, Cambria and Somerset Counties,” Prosser added. If you have a new business idea, want to expand your existing business or just want to learn more about what it takes to take your idea to market, register with SUA today—Right Here. Right Now.